In the last few weeks of pregnancy with Baby N, one of my goals was to fill the deep freeze with meals for after baby arrived. I hoped having a stash of easy-to-prepare meals would make the recovery and transition to motherhood smoother. After haphazardly throwing together an ingredient list (and making a memorable trip to the grocery store with a very full shopping cart), I spent most of a Saturday in the kitchen prepping meals. Ingredients were tossed into freezer bags to create over a dozen crockpot meals. A soup pot filled with oatmeal boiled away on the stove. The oven ran at a steady 350 degrees for hours. My husband dutifully chopped ten large onions by hand, doing his best to fend off the tears. With a newly filled freezer, I collapsed on the couch, exhausted but pleased to cross another item off the pre-baby to-do list. Ironically, a full three and a half months into parenthood, the deep freeze is still full of freezer meals. Although the breakfast sandwiches and oatmeal disappeared quickly, the rest of the thoughtfully prepared meals continue to wait their turn. Although we hadn’t anticipated it, the act of cooking dinner each evening helped to keep us grounded. In our new role as parents—where everything felt new and unknown—we enjoyed the familiar routine of turning on the stove and cooking simple meals. It was a way to connect our new lives with the old, as we evolved from a family of two into a family of three. Lately, however, there is increasingly less space for the frozen meals as the freezer space is steadily being replaced with bags of breastmilk. 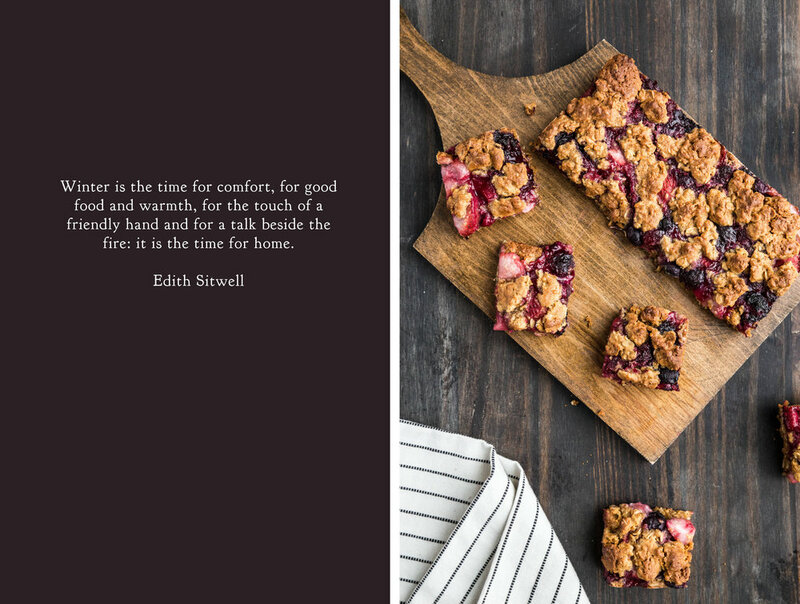 It’s time to start enjoying the fruits of our labor. 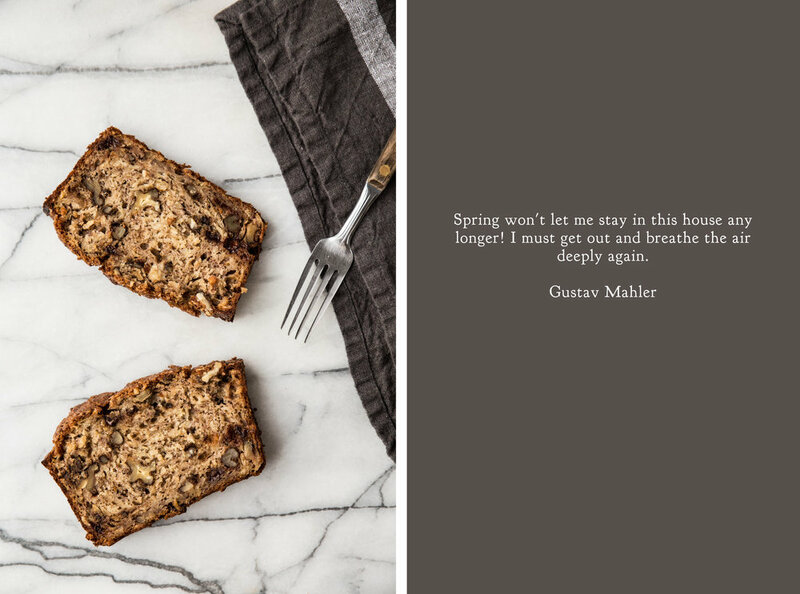 While reorganizing the freezer last weekend, I was delighted to find a hidden loaf of this Banana Oat Bread buried beneath a bag of Italian chicken and a marinated pork shoulder. Needless to say, it disappeared quickly (nursing hunger is real). Unfortunately for me, there are no more loaves hiding away (I double checked), so I’ll have to bake up another one to take its place. With my free time for baking being limited since going back to work, it would be nice to have a reason to spend an afternoon in the kitchen again. My husband already said he’d take the baby for an afternoon so long as he gets a slice warm from the oven. I think that’s a fair trade, don’t you? 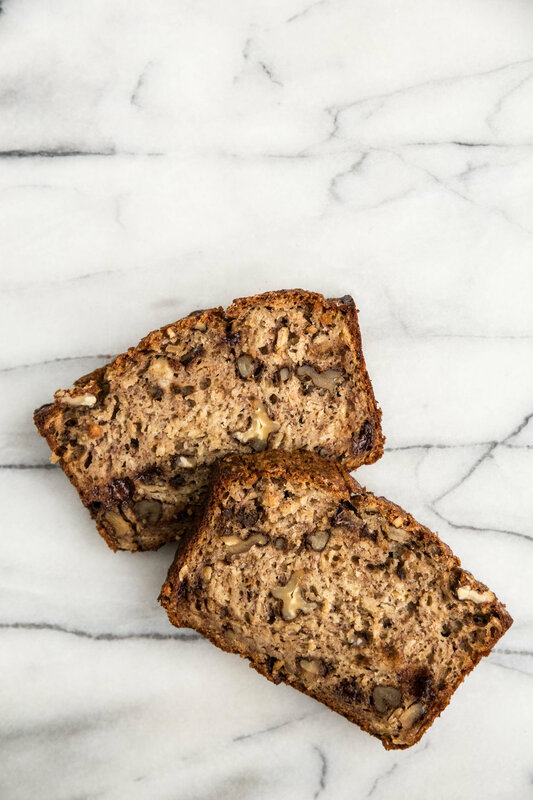 This Banana Oat Bread is simple in construction and customizable to your taste, The bread itself is subtly sweetened with maple syrup, which allows the banana flavor to shine. 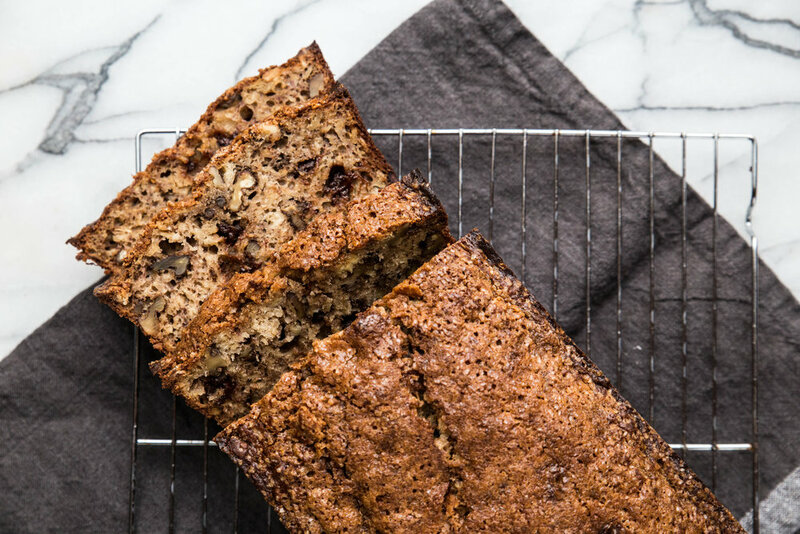 The addition of oats adds a comforting flavor to the loaf. My preference is to add chocolate chips and chopped walnuts to my loaves, but you can choose your own mix-ins (or forego them completely). While I like to toast each slice and slather it with butter, the bread is equally delicious served at room temperature straight from the pan. In a large mixing bowl, whisk together mashed bananas, maple syrup, vegetable oil, eggs, and vanilla extract until uniform. Whisk in the cinnamon, nutmeg, baking powder, baking soda, and salt. Gradually stir in the flour and oats. Fold in the chopped walnuts and chocolate chips. Set aside. Pour batter into prepared pan and smooth until level. Sprinkle raw sugar evenly over the top. Bake for 55-65 minutes, or until a toothpick inserted in the center comes out clean. Cool in pan for 10 minutes before removing and placing on a cooling rack to cool completely. Spring is a time of transition. The long daylight hours and warmth of the sun bring promise of summer, but the chill of the mornings are still reminiscent of winter. The bare branches are beginning, ever so slowly, to gain color. In my personal life, it is also a time of transition. After an exhausting search for a house involving multiple offers and multiple disappointments, an offer was accepted on my dream house. I am still nervous, fearful that somehow even now it will all be too good to be true. There are still compromises, as I knew there would be (mainly being in proximity to a busy, noisy road), but the rest is more beautiful than I dared to imagine. As the reality of a huge purchase is settling in, I am trying to shake off the anxious energy building within me. The closing date is two months away, so I'm spending my time designing the new space instead of worrying about the decision. The move from an apartment to a home will be an enormous shift in a dozen different ways, but I couldn't be more excited about the change. Over the last couple months, the overwhelming stress of the house search made it difficult to take proper care of everything else. Dishes sat on the counter, clothes piled up on the floor, and other responsibilities were set aside as all free time was devoted to looking at houses. Making meals in large quantities was one choice that helped ease the stress. One of the best breakfast decisions was making a large batch of baked oatmeal on the weekends. During the spring months, when the weather is still unpredictable, I find that a big bowl of hot cereal satisfies the hunger as well as the soul. Oatmeal has a warmth and heartiness that starts a day off right. 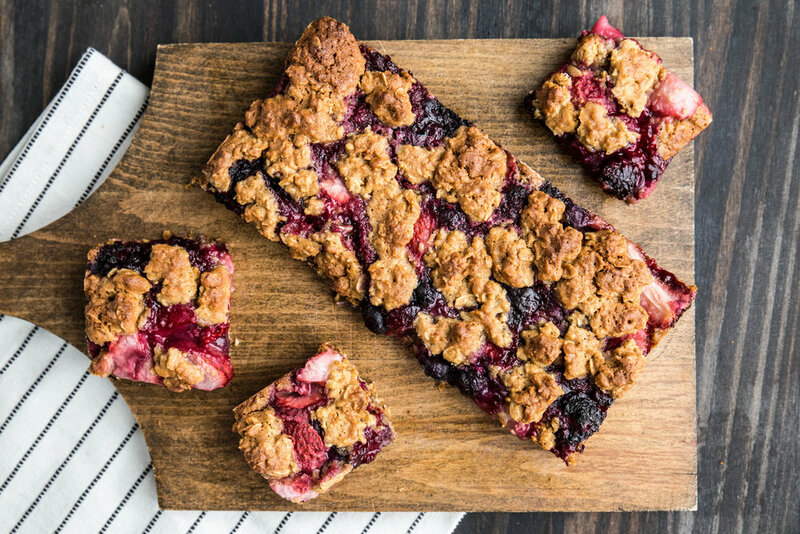 With this baked version, I used frozen blueberries for convenience. The oatmeal comes together quickly and leftovers can be easily reheated to enjoy during the rest of the week. Blueberry Banana Baked Oatmeal is a hearty breakfast that is enjoyed hot from the oven. Cinnamon spiced oats are layered with sliced bananas, toasted almonds, and blueberries. The oats are lightly sweetened with maple syrup; additional syrup can be added to each serving to find the ideal level of sweetness. 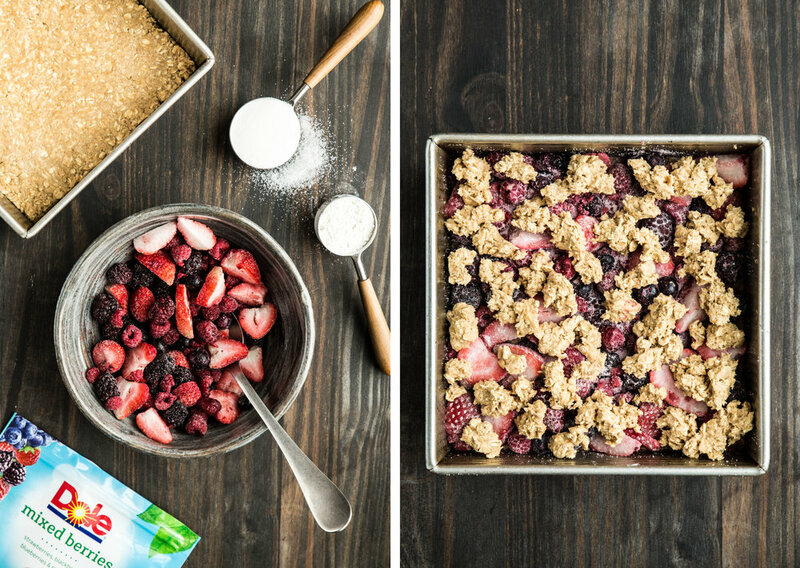 The baked oatmeal reheats well, which makes it ideal for a quick breakfast on weekday mornings. Preheat oven to 375 degrees F (190 degrees C). Grease an 8 x 8-inch square baking pan. In a medium bowl, stir together the oats, half of the almonds, baking powder, cinnamon, and salt. Set aside. In another bowl, whisk together the milk, maple syrup, egg, olive oil, and vanilla extract. Set aside. In the prepared pan, place banana slices in a single layer. Sprinkle on 2/3 of the blueberries and cover with the oat mixture. Pour milk mixture over the oats. Sprinkle the remaining 1/3 blueberries and remaining almonds. Bake for 35-45 minutes, or until golden brown and oats are set. Serve with a splash of milk and a drizzle of maple syrup for extra sweetness, if desired.